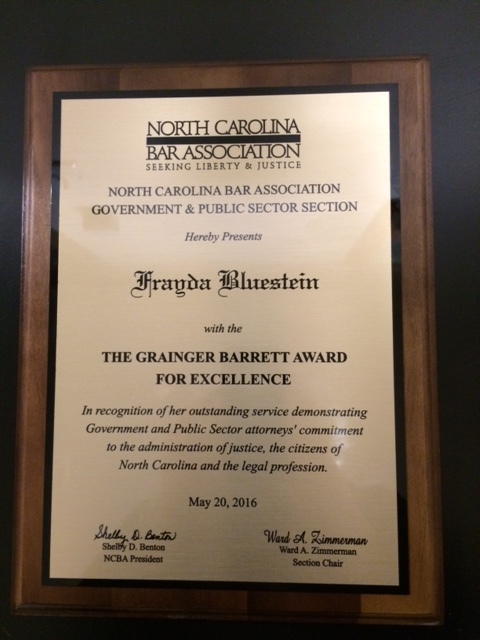 Last week Frayda received the Grainger Barrett Award for Excellence from the Government & Public Sector Section of the NC Bar Association. 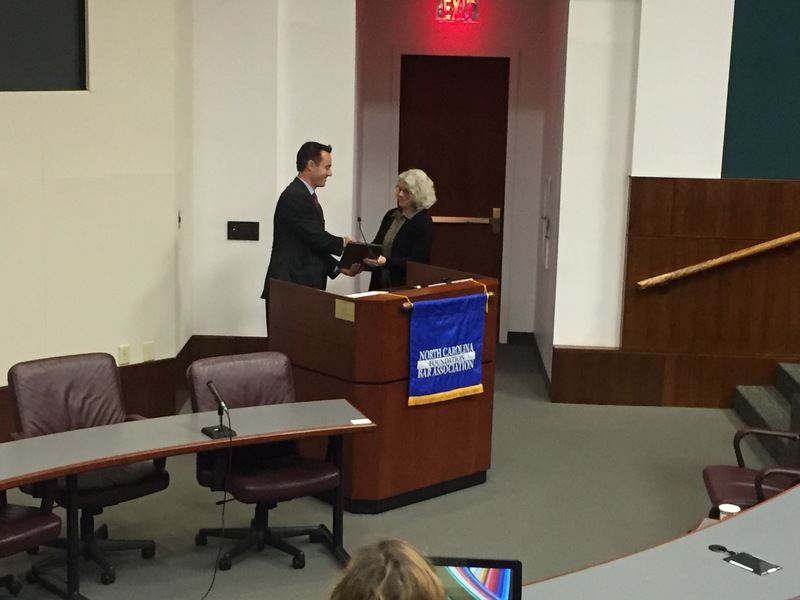 The award is given to honor “an outstanding government or public sector attorney as an exemplar of the excellence, dedication and passion for justice of North Carolina’s government and public sector attorneys.” It is hard to imagine a more deserving recipient than Frayda. The following criteria for the award sound like they were written with her in mind. An exemplary record and reputation in the legal community, and the highest ethical standards. An exemplary record of community service. An exemplar of the quiet excellence of North Carolina’s government and public sector attorneys. Her nominators know Frayda’s work extremely well, and they are ideally suited to understand its importance. 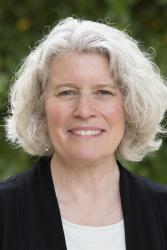 One was Judith Wegner, a professor at the Law School who teaches local government law and who once served on the Carrboro Town Board. The other was Bob Hagemann, the Charlotte City Attorney. Here’s the part of their nomination of Frayda that speaks most strongly to me. “She has played a crucial role in hiring, supporting and mentoring the increasingly diverse group of faculty members at the School, enhancing their effectiveness for the benefit of governments and government officials . . . .” Amen. Frayda has dedicated herself to the mission of the School of Government, and she has done it in ways that support her colleagues. She always puts the interests of others first. Frayda works to insure that we are doing everything possible to support faculty and staff and to help them succeed. That is true in her role as Associate Dean for Faculty Development, which she does in addition to her full-time faculty role, and informally as a thoughtful and concerned colleague. The School is stronger and better because Frayda finds ways to help all of us—with advice, ideas, encouragement, and moral support. And simply through caring for us. Grainger Barrett was a faculty member here and he died way too young. He left the faculty and ultimately became a county attorney. 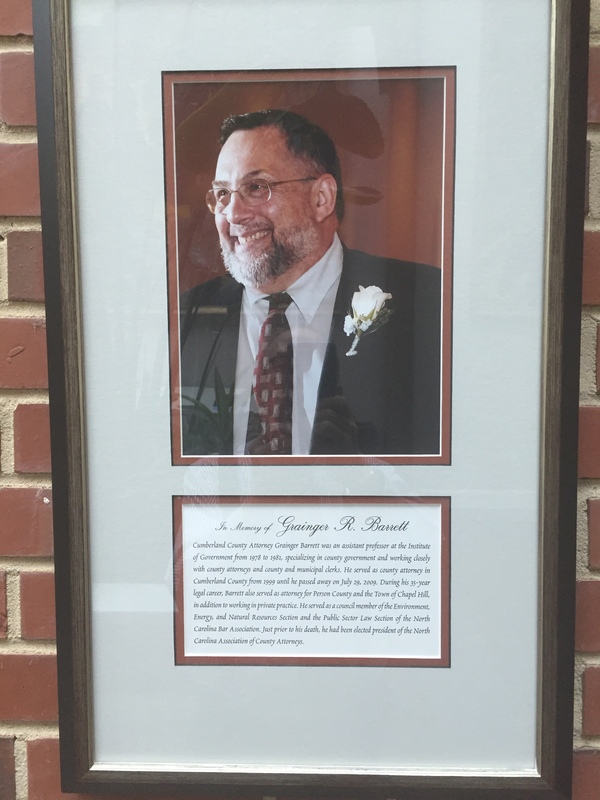 In the last few years before his death, Grainger occasionally would call me to talk about the importance of our work and how proud he was to have been a part of it. He would have been proud to know that Frayda received this award. Congratulations to her for this wonderful honor. Cheers, Frayda, my former teaching mentor! Well deserved! What a deserving honor for Frayda, and a real compliment to the School as well. Congratulations Frayda! Congrats Frayda! Well deserved honor! Thanks for your kinds words, Mike. And thanks to you and Tom for all of your support of my faculty and administrative work. Of course, the greatest reward and honor is that I get to do this work every day with all of the inspiring and dedicated people at the School of Government. It just doesn’t get any better than this. Congratulations to Frayda for this highly deserved honor. Congratulations to you, Frayda, on your well-deserved recognition! It is such an honor to work with you. Congratulations, Frayda! I am not surprised that you won this prestigious award. Also, Grainger Barrett was a faculty member when I started work here in 1981. And excellence continues to cycle through the School and its mission. Congratulations Frayda! Grainger would be proud and no doubt is smiling right now! Congratulations from Grainger Barrett’s kid sister! How nice. I worked closely with Grainger, and we even played together in a softball league. I loved talking to him. All the best.